As teachers we all know that literacy (and numeracy, but I’m not touching on that in this post) is the core skill everyone needs to be effective and empowered members of our society. At a top level to be literate can be simply defined as to be able to communicate meaning. This meaning involves using the communication and understanding of the user’s role and responsibility in a feedback loop. While our focus in the primary years has been and will continue to be about teaching reading, writing, listening and speaking, these 4 strands of the curriculum are much broader when the various modalities of meaning are included in our thinking. What are the everyday literacies that learners bring into the classroom? How can I value and integrate these literacies into my own practice? Multimodal is defined in the Australian Curriculum as the strategic use of ‘two or more communication modes’ to make meaning, for example image, gesture, music, spoken language, and written language. Even this definition does not provide an easy view to the digital environment our learners are often immersed in. If we consider the rapidly developing virtual or augmented reality scenarios or activities that are coming online, that could provide another level of complexity to how learners will need to communicate. A student in an immersive environment is still in a physical environment and needs to be literate for both! Jon Callow has written on multimodal literacy and in a recent article, he emphasised that print based approaches alone for literacy instruction are no longer appropriate. The Leading a Digital School conference will have presentations from Jon and others that will further inform our growing understanding of this important area of literacy. 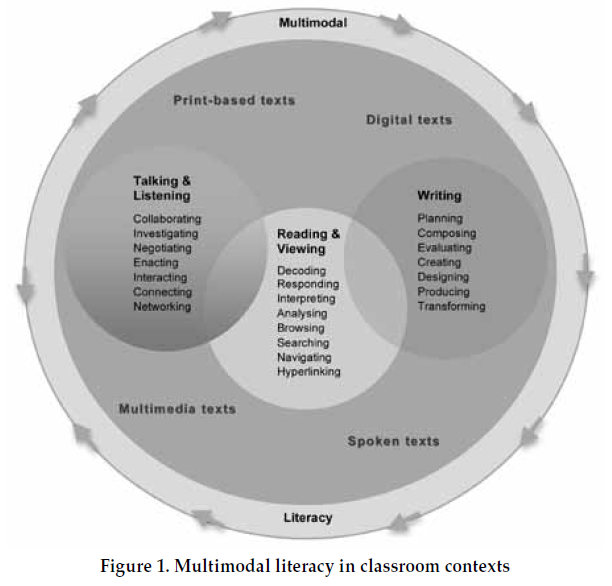 Walsh, M (2010) Multimodal literacy: What does it mean for classroom practice?